Bed no Breakfast room, cheap sleep in KNOKKE centre! After numerous international travels, also B&B, bed and breakfast, chambre d’hotes, zimmer frei, we decided to install our own logies room, which we are glad to put at your disposal. 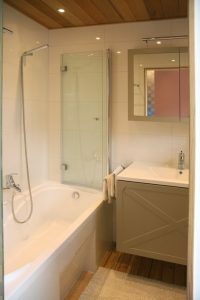 The room is located on the first floor and provided with a nice bathroom +wc. Our house is situated close to main shopping street and sea; in the centre of KNOKKE. (shops are open on Sundays). Bruges (15 km), Zeebruges (7km), Damme (10 km) and Sluis (6 km) can be easily visited by bike/motorbike/car. Bus /train /tram on 200m. The polders and sea area are ideal to explore by bike or motorbike. You can make a good walk on the beach or visit the nearby nature reserve Het Zwin. We can suggest great restaurants and bars near our bnb or on the beach front. 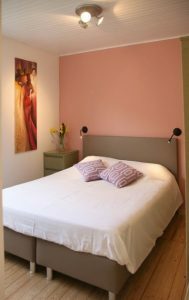 KNOKKE LOGIES is THE place for a cheap sleep in Knokke, bed no breakfast. Breakfast is not included, but there are plenty of nice places in Knokke for a good and extensive breakfast in the vicinity (start from €4). Free coffee and thé facilities in bnb. Also free bicycles storage next to room! Two free bicycles at your use! Guarded parking 50m from the bed no breakfast, or in the street. In our home you will still find that personal, homely atmosphere. The bnb owners are always available to provide you information about the city, while respecting your privacy. Our bnb logies is the perfect place to discover the biking paradise, beach and sea in Knokke-Heist. Best choice from comfortable, competitively priced room. Exactly what you need for your busy stay in Knokke.